…almost. Other than a little more sewing on the awning and the installation of the oven light (thus far just a switch and some wiring), we are done! 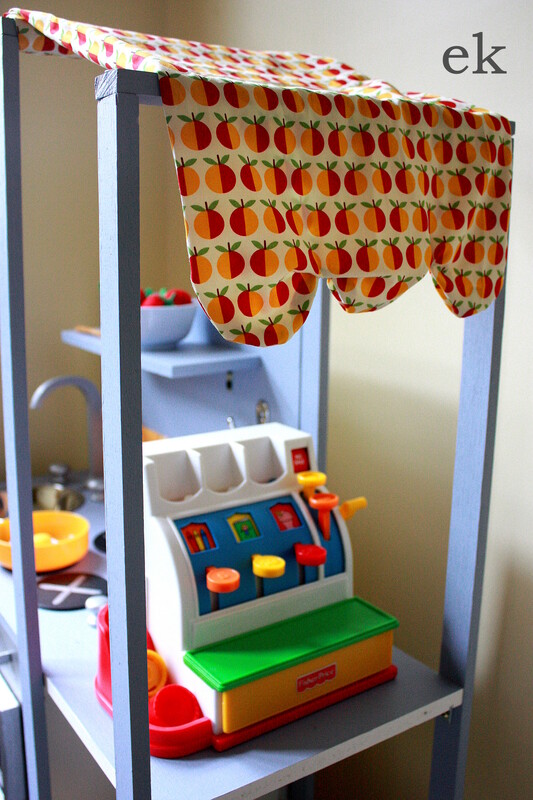 I didn’t want to limit play so it is part kitchen, part grocery store. I have plans to paint the back of the splashback with a streetscape or café window but they will probably never eventuate. 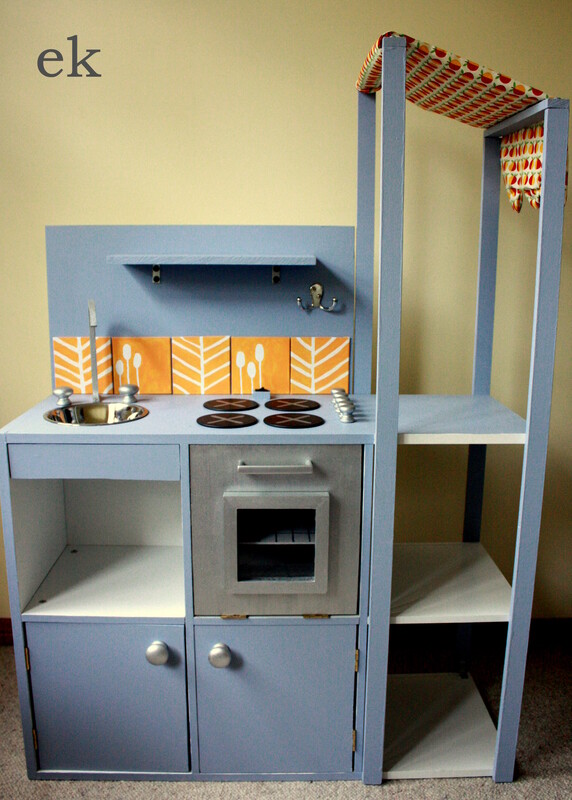 The left side has a chalkboard and another hook. The taps and knobs turn, the oven tray comes out and eventually the oven light will turn on. 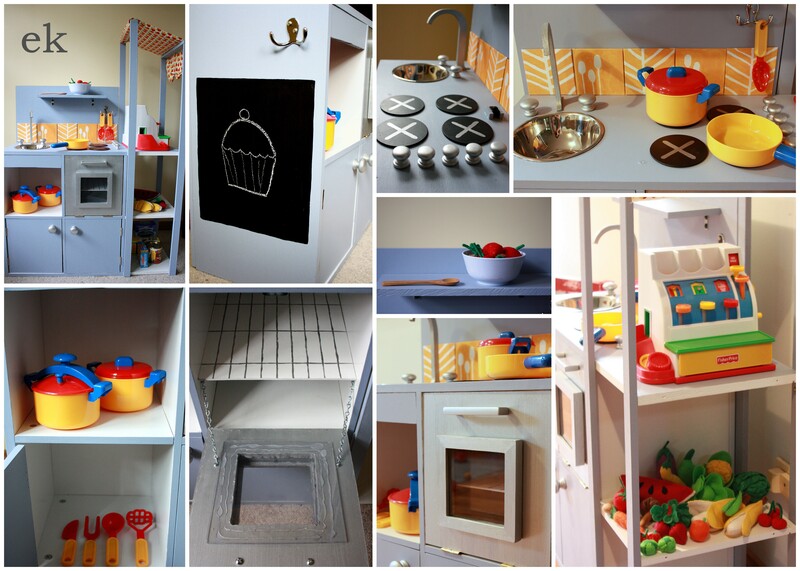 Everywhere I looked to get my inspiration for this little kitchen referred me to Out of the Crayon Box, which has an amazing step-by-step tutorial on turning an old piece of furniture into a play kitchen, so this was our starting point too. It’s what gave us the ideas of using a wooden letter “J” as a faucet (although we ended out using part of the letter “U”), a metal bowl for the sink and coasters as burners, as well as lots of hints about assembly. It helped to have a husband willing to do the project with me too. The oven door is a small photo frame and two pieces of perspex, and some chain to stop it opening further than 90 degrees. 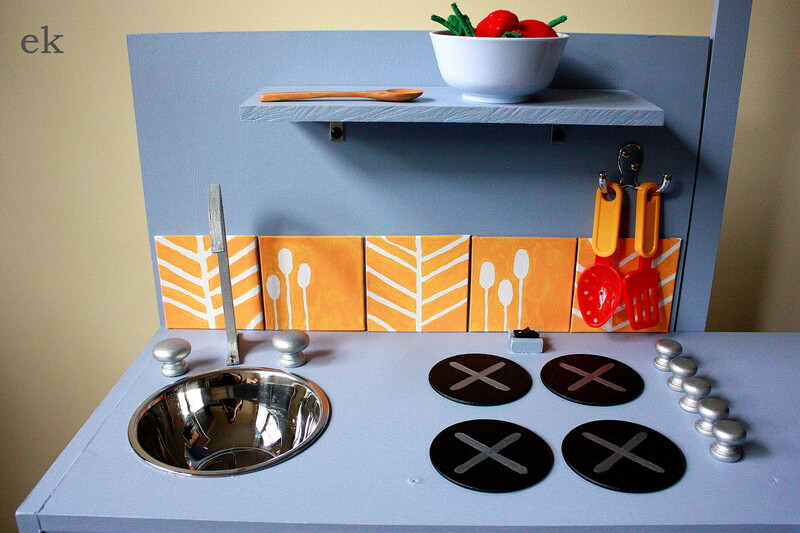 The splashback tiles are small canvases. Mum supplied all the utensils, pots and pans and the cash register so it’s well stocked! Can’t wait to play chef with my little man. Why all the felt food? It’s for my little man’s upcoming 2nd birthday. Well, really it’s just secondary to his birthday present. This bookcase will soon be a play kitchen and of course he needed some food to stock it with. (The bookcase is smaller than it looks – that chair is child-sized). In case you’re wondering, it takes a long time to make large holes with a power drill and some sandpaper. Some of the small details. I’ll show you more once all the drilling, sanding and painting is finished.